Tim Godlove displayed Bloom at the entrance of the Charles Hutson Horticulture Greenhouse. 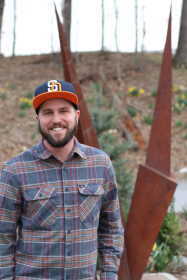 After graduating in 2013, alumnus Tim Godlove gave back to Southeast by donating his metal sculpture piece titled “Bloom,” which is displayed at the Charles Hutson Horticulture Greenhouse entrance. “Bloom” is part of a four-piece collection created for his capstone which is the final project done by art students before graduating. Each piece took a total of approximately 100 hours in addition to planning and creating small prototypes. Altogether, this sculpture was composed of pieces of scrap metal that other students did not want. Godlove said the scraps of metal other students used added character to the sculpture. Godlove expressed the relaxing aspect of creating the piece. Working on art for hours at a time allowed him to meditate, concentrate and reflect, similar to yoga. “I was thinking about my grandma who was really sick at the time while making this art, and it really helped me to find my place in it,” Godlove said. This piece in particular reminded Godlove of origami with its intricate folds and pointy tips. The piece started out as rectangles. After cutting, flipping, tacking and welding it all together, “Bloom” was created. During his studies, Godlove took a 3-D class under professor Chris Wubbena. It made him realize he had a special interest in sculpting. Wubbena had many good things to say about Godlove’s work. “Tim was a great student and had a great work ethic in class. He put many hours into those sculptures, and they really paid off; a very nice exhibition of solid work,” Wubbenna said. Godlove has shown off this piece in various shows including Missouri Valley College in Marshall, Missouri and at the annual culture walk in St. Joseph Missouri which, has made him approximately $2,500. After speaking to Bonnie Svenson, the wife of Department of Agriculture associate professor Sven Svenson, about his art, they were sure this piece would be a perfect fit. Godlove decided to donate this sculpture not only because the name corresponded with where it would be displayed, but also because he enjoyed being a part of the Cape Girardeau community. Godlove thought there would be no better place than his alma mater. Godlove has currently been taking a break from sculpting and has been focusing more on his band “Isabella,” for whom he is the lead singer. He is looking to get back into sculpting. He said donating “Bloom” is definitely motivation to start. Godlove’s advice to art students is to start breaking the ice and talk to cities and universities to get art displayed before graduating, saying it will help keep the creative momentum going. He also said to take advantage of the opportunities and great facilities here at Southeast. “Examiner,” another piece of his BFA capstone collection is currently on display at Ebb & Flow Fermentations in Downtown Cape Girardeau.